Sometimes I jot down a note and it’s very negative. When that happens, I re-focus and make it a positive post, like this one. Start Writing Now that my writing is public knowledge, people confide in me. Cousins, the man at the Florida Writers Association conference, and the woman who asked me to ghostwrite her novel each want to write. But when I ask them what they’ve written so far, the answer is nothing. I advise each of them the same. Start writing. Whether it’s a public blog or a private diary, the first step is to begin. Make Time to Write I often thought my job was getting in the way of writing. That wasn’t the truth. And because no one was going to offer me more time in the day, I had to shift my priorities. Instead of watching the Today Show every morning, I wrote for two hours. Then, I began my regular day. Where could you shift your priorities so that you can make time to write? Take Time to Edit After you’ve written something, consider that your first draft. All writers have first drafts, and second, and thirds, and…you get the picture. As a former English teacher, rarely have I seen a masterpiece written in one fell swoop. When you take time to write, that means you might find yourself pondering over the use of the word stroll, saunter, or walk because you know each one of those words will change the connotation and flow of your sentence. So take the time to think about the words you’ve written in a meaningful way. I’m glad the innovation shone through. Sometimes people read the title and assume they know what’s inside. But it’s a false assumption. Likewise, if I would’ve thought these were trite narratives, then I might not have written the book. So my advice? Don’t worry about it. Somebody wants to read it the way you’ve written it. You’re Worried about What Other People Think If you follow my blog, then you know I write about many things that have happened in my life. Stories include family, friends, and people I barely know. I couldn’t write half of what you read here if I stopped to worry about someone’s hurt feelings and reinvention of history. Initially, an Anne Lamott quote helped me forge ahead with authentic writing, “If people wanted you to write warmly about them, they should have behaved better.” That quote changed my entire creative nonfiction writing life. The other part that has helped me write the truth is to separate fact from emotion. For example, it’s a fact that my dad packed up my belongings in the middle of the night while I slept. Consequently, I felt abandoned and pushed aside because of what occurred. Stick to the facts and make clear when you’re describing an emotion. I hope one of these sparks the writer in you. Trust me. Someone, somewhere is waiting to hear your voice, even if the someone is you. There are so nice and helpful people , they criticize in a helpful way. I think the best way to write is not giving up. Some people writing negative thoughts are poor because often they lost their wishes. So, I give them friendly thoughts finding back their own dreams. I´m happy to say – thank you for following my blog. Let me say, our small conversation inspired me to a new article. Thank you. Yay! I’m happy to hear it! Oh, you know what I’m going through – Take Time to Edit! I love this post. When I first started my blog in 2013, I said it was because I had so much to say and felt safer talking to strangers than to people I knew. I still believe this. I have doubted myself throughout my blogging journey and I have to remind myself why I started in the first place. Aha! 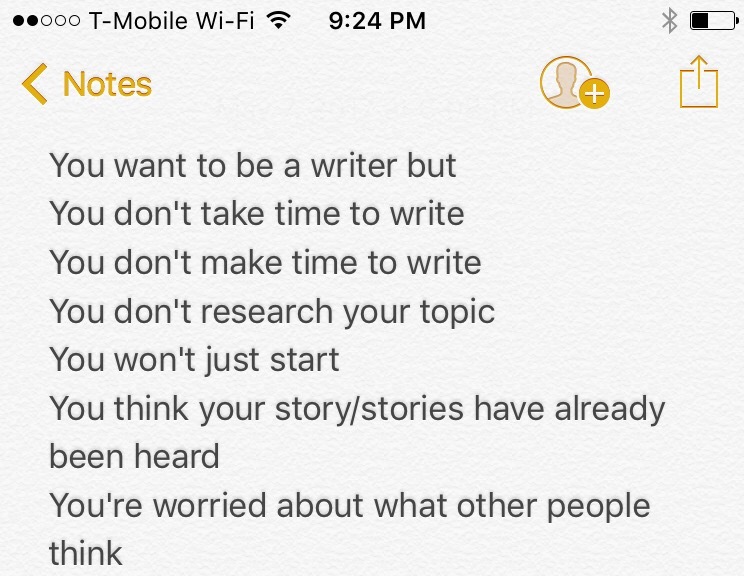 This is a good addition…remember why you started writing in the first place! Thanks for the compliment and comment Catherine! You’re welcome girl! Hope your book is doing well. I have often thought that one of the hardest parts about being a writer is actually writing something. And the other hard thing is beginning to think of ourselves as writers. I remember the first time I claimed that title, and it was liberating! I agree! A lot of us have to stop saying we’re “aspiring” writers and just claim the title, as you say. It makes a world of difference. You’re welcome Caz! Writing can be the hardest part about being a writer, but you gotta find a way if you really want to do it, or at least that’s what I’ve come to understand. Even if you’re the only one who ever sees it…write. Great advice. Priority matters most. Absolutely. If writing is a priority, then it’ll happen. Perfect advise! I love what you said about shifting priorities in one’s day. I watch an awful lot of television. Between Netflix and OnDemand, there is always something to watch. My spirit is moving me to do a serious fast from this habit. I often tell myself, while, watching a program, “You’re putting your own creation off to watch someone else’s. It took me four or more years to write both of my novels due to not prioritizing writing everyday or sticking to a writing schedule. This will not be the case with the one I’m working on now. Thank you for the encouraging post. You’re welcome LaCharmine! We’re so easily distracted, and nowadays, it’s easier than in the past. There’s something for everyone lol Best of luck as you continue to get all your writing done. Great post! I think writing is a job, like any other job, and a responsibility one takes upon oneself, and like any job and any responsibility, it requires a structured, concerted effort and a set schedule, inspiration or not. Absolutely agree! I tell people all the time, I spend as much time blogging as I would at a part-time job. True for me as well, but I also don’t buy into writer block excuses. Anyone who claims it should go work as a reporter on a deadline or undertake to write grants on a deadline. When you don’t write, you don’t eat, blocks notwithstanding. Of course Kally! Thanks for adding that. I do think that helps to focus one’s thoughts. Tough to be ones own editor. Thanks for the encouragement. True, but necessary up to a point when you cannot be objective. I hear you Chris. It’s challenging to materialize dreams when you’re focused on your well-being. Well the good thing is we always have now. Yeah, accept it doesn’t last long. Beautifully Said, thanks a ton. I really enjoyed reading this & thanks for being my first like on my blog from a seasoned blogger. I am still excited. Say whaaaat??? I didn’t realize I was THE first like. That’s awesome. Thanks for reading, commenting and complimenting this. I appreciate it. Also, I’ll be answering your question soon. I enjoy reading your blog Post. But this one is spot on. I have been trying to write but every time I come up with excuses. I think what I have in my mind is what you explained in the post too. It was an interesting post and honestly much needed Eye opener for me. Thanks so much for stopping by, reading, and commenting! I’m glad you enjoyed this and that it made you think a little differently. I’ll be looking at your blog soon. I love this post and I just love writing! I personally think it’s magical. We can create entire landscapes with a few sentences, new galaxies and beyond. It’s like flying to me. I wrote a post about conquering writers block recently, so if any writers are stuck, come check it out. Thanks so much for reading and commenting. I agree. To turn thoughts into tangible and understandable things is amazing. I’ll be sure to check out your blog soon. Great advice. There’s nothing new under the sun as they say but the sun rays shine in all different angles. Always something to write just got to sit down and do it. Thx for sharing! Writing has truly been a gift! These are great! Thanks my dear! Glad to see you’re doing well. I am! Thanks so much! Thanks for your inspiring words. These are all thoughts that I had, and still sometimes have, about publishing my book. You really nailed it with this post.